Ratcliffe-on-Soar church. Photograph by E L Guilford. During the few minutes at my disposal, I do not propose to do more than briefly refer to the architectural points of interest that are to be found here before passing to the series of alabaster tombs, which enrich this church. In enumerating the architectural features, I have had the valued assistance of our zealous member, Mr. Harry Gill. They consist of an Early English chancel, Decorated nave, and south aisle, a rebuilt north aisle, and Early English western tower with spire. The spire is peculiar in being a broached spire—having pinnacles at the corners—it has every appearance of being the production of the same builders as the neighbouring spires at Normanton (which we have seen earlier in the day) and Gotham, the corbel table in each case being similar. The nave and south aisle are of the later Decorated period (1350-70), and the window tracery confirms this. The western arch, with the Early English window in the west end of the church, is also worthy of attention. It will be observed that a stone mensa, or altar slab, on which traces of the consecration crosses may be detected, is still in use. Although Dr. Cox refers to it as the "high altar," there are indications that this is not the original high altar, but has been removed from the side chapel in the south aisle to its present position. There is a sepulchral recess in the north wall of the sanctuary, probably a founder's tomb; a graded triple sedilia; a 14th century octagonal font on a more modern base; in front of the tower screen may be seen a discarded Jacobean table, 5ft. 10in. x 2ft. 8in., and there are altar rails with balusters, which indicate them to be of a post-Landian period. In the north aisle is an alabaster slab bearing the figure of a priest in his vestments, with chalice, wafer, and book. 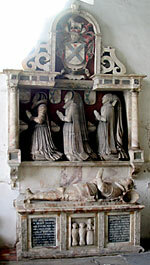 The series of four fine alabaster altar or table tombs are those of four successive generations of the once influential, but now extinct, family of Sacheverell, who were lords of the manor of this parish and of the adjoining parish of Barton-in-Fabis, and also owners at Hopwell and Snitterton in Derbyshire, and later, by a marriage with an heiress of the Statham family in the 15th century, of Morley, in the same county. The Sacheverell estates were of large extent, and I have been told that a man could ride from Radbourne, in Derbyshire, to Nottingham without once quitting these estates: that may or may not have been so. The manor of Ratcliffe was the property of the Duke of Buckingham, but was forfeited by him (temp. Richard III.) and granted to Sir Gervase Clifton, but recovered by a subsequent Duke (temp. Henry VIII. ), whose successor was attainted for treason, and the forfeited manor eventually came into the possession of Sir Richard Sacheverell, Knight, brother of the man who married the Statham heiress already alluded to. Ralph and Cecilia Sacheverall (photo by A Nicholson, 2006). In order of antiquity, the oldest tomb is that against the wall of the lengthened north aisle, on which is represented Radulphus Sacheverell and Cecilia his first wife, who was daughter and heir of John Durance, of Isham. He died on 14th August, 1539, leaving instructions that he should be buried beside his wife (Torre MS.). The tomb is a splendid example of the skill of the local carvers of alabaster, and the material presumably was forthcoming from the neighbouring Redcliff, from which the parish no doubt derived its name. I would call special attention to the delicacy of the carving of the lady's necklace, his collar of SS, also that in the panels and the spandrels, and the graceful lettering of the inscription from which we learn that he had a second wife, who probably outlived him. From the Inquisition, which will be found in the volume of Inquisitiones Post Mortem published by our Society in 1905, it will be seen that this Radulphus left a son and next heir, Henry Sacheverell, aged 30 years and upwards. The adjacent double tomb is that of this Henry and Lucie, his "wyf," who was a daughter and heir of John Pole, of Hartington. Round the base may be seen a series of female figures, all in slightly varied postures, holding shields in front of them and having scrolls behind their heads. These numerous figures can scarcely be intended to represent his offspring, for it is not recorded that he had more than two sons and one daughter. He instructed his executors to "make a tomb of alabaster or other fine stone . . . with a Scripture to be engraven thereon ... to the intent that the beholders and readers of the same may remember his Soul and all Christian Souls and pray to God for the same." 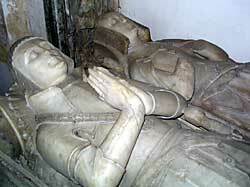 Tomb of Henry and Lucie Sacheverell, died 1558 (photo by A Nicholson, 2006). The inscription on the chamfered edge states that he died on 29th July, 1558, his wife having predeceased him on 10th February, 1554. It will be noticed that his misericorde dagger is under his thigh, not alongside it, as is usually the case: and in the wife's costume will be detected an early indication of the fashion of dress that became a characteristic of Queen Elizabeth's reign. There are no armorial bearings on this tomb; possibly the shields held by the female figures may have borne them at one time, if so, all traces of the paint have disappeared. Passing eastwards, we are confronted with another massive tomb of the same material. It is that of another Henry Sacheverell, son of the foregoing, who married Jane, daughter of German Ireton. He is clad in heavy plate armour, and his head rests upon his helmet. The lady's dress lies in ample folds about her feet, and with a goffered ruff of a nebule pattern around her neck, so universally worn in her day; her well-carved features, which it is pleasant to think are a likeness of the lady, have so far, luckily escaped mutilation, although the tomb has had rough usage at some time, and one of the shields has been turned upside down. 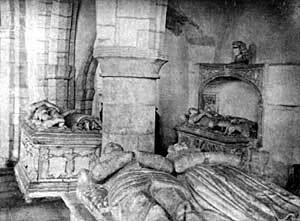 Beneath the effigies are represented the family of three sons and three daughters, with an inscribed slab of slate between the two groups, on which, however, the date of the squire's death has not been filled in. This tomb cost £30—at least that sum was furnished by his son for the purpose of a tomb to his father (Torre MS.). A shield of arms shows those of Sacheverell, impaling argent, a fesse sable, in chief three lozenges gules (or sable): if these arms are intended for those of Ireton, they do not correspond with those used by the illustrious Cromwellian general of that name. 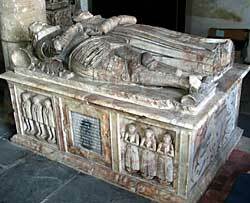 Tomb of Henry Sacheverell, died 1625 (photo by A Nicholson, 2006). We now cross the chancel to the tomb of yet another Henry Sacheverell, son of the man whose tomb has just occupied our attention. This man willed a sum of £40 for a tomb for himself. This Henry was the last Sacheverell of Ratcliffe. His three wives are shown in an attitude of prayer, whilst his effigy alone occupies the mensa or slab. The charming simplicity of the group of his three little children is worthy of notice, and it will be observed that two are represented in their grave clothes. The squire died on 17th January, 1625. His sister married a Hutchinson of Owthorpe. Notts., and, failing any male Sacheverell issue, the inheritance passed to her son, Sir Thomas Hutchinson, who "out of tenderness to his cousin Eleanor," daughter of this Henry Sacheverell, agreed to divide it with her. This Eleanor married firstly Roger Colcunbell, and to their issue this moiety of the property passed, whilst the other moiety was sold by Sir Thomas Hutchinson's son to Alderman Ireton, brother of the general,—"the great instrument in the unhappy wars," as Dr. Thoroton terms him. The first baptism recorded in the register here is that of this Eleanor Sacheverell, under date 29th May, 1597. She married, as her second husband, William Hasard, her servant, whom Dr. Thoroton tells us "proved a good Husband to her, and a kind and careful Father to her Children." She died on 17th September, 1664, and was buried on 19th. The arms of Sacheverell are—Argent, on a saltire azure, five water bougets or. Crest—A goat statant or passant. Mr. Gill called my attention to the words in Shakespeare (Henry VIII., act ii., scene 3), "the capacity of your soft cheverel conscience: "in Chambers' Dictionary cheverel is said to be, "soft flexible leather made of a kid skin." Can this be the origin of the name Sacheverell and their family crest the goat ? A family of Deverill for many years were farmers in this neighbourhood; it is said that they were retainers of the Sacheverells, and their name was a corruption of De Sacheverell. The alabaster period extended from early in the 14th till the middle of the 17th century, so that the tombs of that material in this church were executed during the latter part of that period; the quarries that yielded the best material began to give out about the year 1650. The name of Sacheverell still appears among the Christian names of several of the Derbyshire families. Let us hope that some who claim the right to thus use the name may see that these fine tombs are not permitted to deteriorate. After Ratcliffe-on-Soar came Kegworth, and here tea was provided about 4 p.m. on the lawn of the Station Hotel. 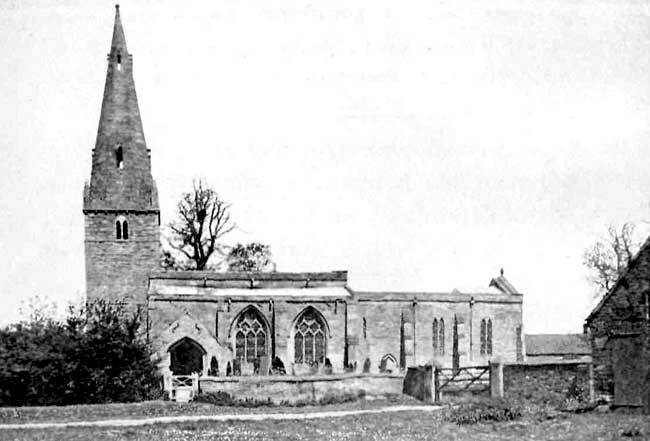 At 4.30 a start was made for Sutton Bonington, where the churches of St. Michael and St. Anne were visited. Some of the members and their friends also went on to Repton Grange (The Hobgoblin), interesting for its 14th and 15th century remains. The following paper was read at St. Michael's Church by the rector, the Rev. R. O. Yearsley, after which a pleasant drive to Loughborough and a return journey by train to Nottingham brought a most enjoyable day to a close.